AYO-Arab Youth Organization of AROC: Arab Resource & Organizing Center are calling for a protest this coming Saturday. 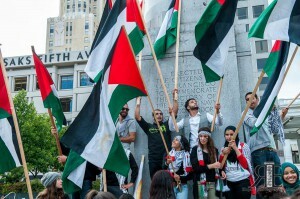 AYO calls on our community and allies to take a stand with Palestine and let the city of San Francisco know that we demand an end to the US support of Israel and their ongoing attacks on our people throughout all of occupied Palestine. Everyone is welcome! Bring your parents, your kids, cousins, friends, extended family! Our voices need to be heard! Never forget that our existence is our resistance! The San Francisco Bay Area says no to zionism! Stop US Aid to the Apartheid State of Israel! Support the Palestinian people’s struggle for liberation! Flags, kuffiyehs, signs, banners,and megaphones are all welcome! Hashtag #Youth4Palestine for more updates and photos and events! Email info @ araborganizing.org to endorse.